Banks and financial-crime investigators in some countries are voluntarily working together to share intelligence related to signs of financial crime. The goal—to deter money laundering and terror financing—drives these collaborations, which some believe are much more effective and efficient than relying solely on mandated AML Compliance. But the voluntarily data sharing concerns some privacy and security advocates. In a Wall Street Journalfeature this week, the Journal reports from the U.K. on a panel discussion at the International Symposium on Economic Crime. Led by U.K. initiatives, authorities and banks in countries like the U.S., Singapore, and Australia have established networks to share their data and knowledge about key behaviors likely indicative of criminal activity, dangerous actors, trends in financial crime, and so on. A financial-crime specialist from HSBC lauded the voluntary networks for their effectiveness in helping manage the risks of financial crime—especially in terms of identifying and focusing on the greatest and most genuine risks, which in turn makes AML Compliance efforts more efficient. One goal, according to the HSBC specialist, was to move to a more holistic approach to risk, where banks move beyond analyzing transactions to analyzing behaviors. But considering and analyzing more risk data can turn into an avalanche of suspicion—and costly work–that does not represent true risk. To make data analysis more efficient and more effective, boosting risk intelligence via voluntary networks helps home in on true risk and then focus remediation efforts there. In the U.S. alone, according to the Journal, institutions submit an average of 2 million reports of suspicious activity every year. But only about 15 percent of these submissions are of immediate value to authorities. While some support information-sharing as a means to achieve much better effectiveness and efficiency in AML Compliance, others push back against the potential conflicts of interest, the lack of public input and consent in this type of voluntary data sharing, the often-limited vetting of participants in this data sharing, and so on. According to the Journal, examples of possible conflicts included the “keep-open” policy for accounts under investigation or the potential ease of infiltration of the information-sharing networks by bad actors. Ironing out these concerns and navigating information-privacy standards will likely require more and more attention as voluntary sharing among banks and authorities grows. With AML Partners’ platform technology for RegTech, updating and upgrading your AML and eGRC software solutions is easier, faster, and much less expensive. Contact us today to explore how platform technology and our end-to-end AML Ecosystem SURETY Eco and the SURETY modules –powered by the RegTech Oneplatform–can transform the efficiency and effectiveness of your unique AML Compliance efforts. SURETY Eco includes fully integrated modules for CDD/KYC on-boarding, behavior/transaction monitoring, and sanctions screening. And AML Partners simplifies your end-to-end fully integrated AML Compliance efforts even further with an optional Subpoena Search module for FinCEN 314a and similar subpoena searches. 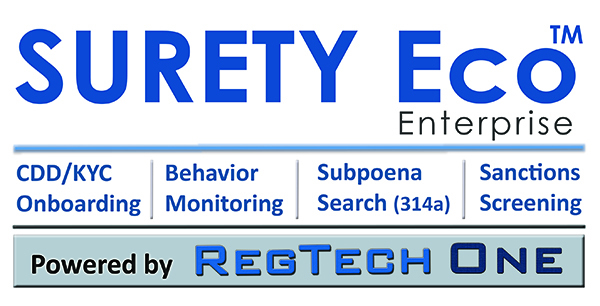 Contact us today to learn more or schedule a demo of SURETY Eco, the AML Ecosystem powered by the RegTech One platform. With extraordinary configurability and built for API extensibility, the RegTech One platform powers not only an end-to-end AML ecosystem but also CECL workflows, vendor management, cyber risk workflows, FCPA workflows, and so much more.